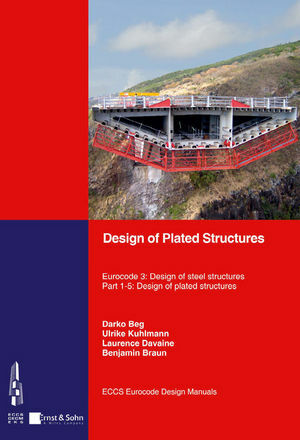 The main aim of this book is to provide practical advice to designers of plated structures for correct and efficient application of EN 1993-1-5 design rules. In chapter 1 the purpose, the scope and the structure of the book is explained. In chapter 2 a rather detailed and commented overview of EN 1993-1-5 design rules is given following the structure of the standard. Shear lag effect as well as plate buckling problems due to direct stresses, shear forces, transverse forces and interactions of these effects are covered. This chapter also includes a reduced stress method and a finite element analysis approach to plate buckling problems. A large number of design examples illustrate the proper application of individual design rules. Chapter 3 and 4 bring two complete design examples on a crane runway and a box-girder bridge. Darko Beg is professor of steel structures and chair of Metal Structures at the University of Ljubljana, Faculty of Civil and Geodetic Engineering . He was a member of the project team that drafted Eurocode 3, Part 1-5: Plated structural elements. He is a member of CEN/TC250/SC3 and a member of three ECCS technical committees: TC8 Stability, TC10 Connections and TC13 Seismic Design. He also chairs the Slovenian National Technical Committee on Structures. Ulrike Kuhlmann is professor of steel, timber and composites structures at the University of Stuttgart, Germany and head of the Institute of Structural Design. She chairs CEN/TC250/SC3 Steel Structures and Technical Working Group 8.3 Plates of ECCS. She was a member of the project team for the conversion of ENV 1993-1-1 to EN 1993 and has since been deeply involved in code drafting. Laurence Davaine is a bridge engineer at the Department of Bridge Engineering of the French Railway Administration (SNCF) in Paris, France. Formerly she worked as a research engineer at SETRA (technical centre for bridge engineering) for the French Ministry of Transportation. She is a member of the Technical Working Group 8.3 Plates of ECCS and involved in CEN/TC250/SC3 Steel Structures for EN 1993-2 (bridges). Benjamin Braun is a scientific researcher at the Department of Structural Engineering of the Federal Waterways Engineering and Research Institute (BAW) in Karlsruhe, Germany. Formerly he worked at the Institute of Structural Design of the University of Stuttgart where he was in charge of co-writing the German National Annex to Eurocode 3 Part 1-5. He is a member of Technical Working Group 8.3 Plates of ECCS.